I’m a Scrooge. 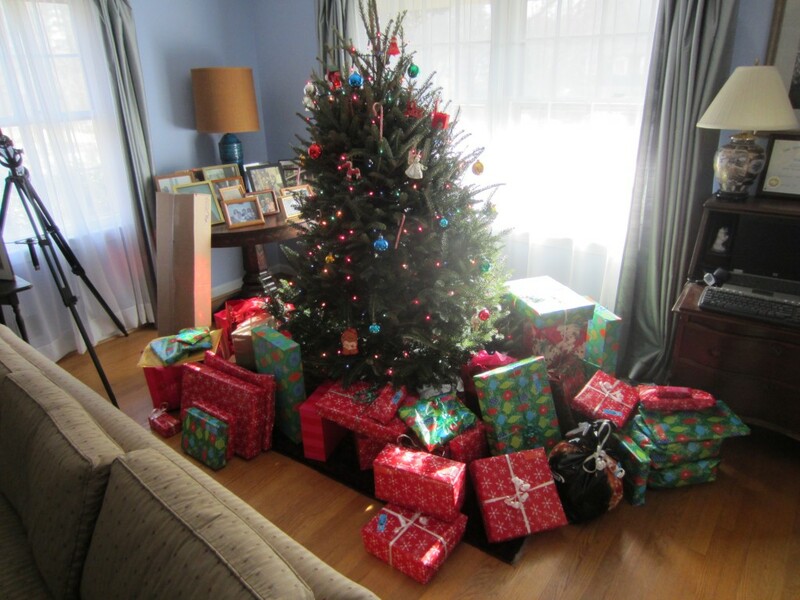 Well, I’m not necessarily cheap (I prefer frugal), but gift-giving and gift-receiving totally stresses me out. The whole process used to be manageable when I was only responsible for giving to my immediate family members, but the list of gift recipients has completely blown up with my marriage to Kyle, as he has a wonderfully close (and large) extended family. Giving presents stresses me out because I’m kind of a perfectionist and I put a lot of pressure on myself to pick out something that the recipient would really like (and that’s very difficult when buying for someone you barely know!). Receiving presents stresses me out because I’m kind of a minimalist and I legitimately do not want or need any more stuff. (Okay, I did come up with a few items for my Christmas wish list that I would like to receive – mostly books I want for reference and replacements items that have worn out.) But the big big reason that giving and receiving stresses me out is that I just don’t get it. Giving and receiving presents doesn’t do anything for me emotionally. Seriously – I took a quiz. I’m sure most of you are familiar with Gary Chapman’s Five Love Languages – the basic concept is that there are five different modes through which people express and receive love. The primary application of this concept is between a husband and wife to keep each other’s “love tanks” full but it also is useful to apply to familial relationships and friendships. It’s really useful to know someone’s top one or two love languages so that you can love them in a way they will truly appreciate. Back to my point from above, though – gift-receiving, for me, is a 0. No component of me naturally “speaks” or “hears” love through gifts. So I participate in it, but it doesn’t mean much of anything to me (aside from “it’s the thought that counts,” of course). Christmas isn’t all about presents, though that does seem to be the part that gets the most hype. My primary love language is quality time, so my favorite part of the holidays is getting to spend lots of time with family and old friends, and I think that’s a common experience at this time of year. If my primary love language were physical touch or some other one the holiday season would probably have no redeeming value to me! This is my wish for Christmas and every other time of year when the focus is on showing the people around you how much you love them: I want to know and speak the love language of each of my family members and close friends (and vice versa). This season we’re slated to buy 26 gifts for individuals/couples, which only represents a single way of expressing love – that’s what we’re stuck with because it’s the expectation and we have no additional information. But it’s a reasonable guess that getting a present is not the preferred way to receive love for the majority of those people. While it’s true that gift-receiving is likely the most expensive of all the love languages to speak, this proposal isn’t really about not-spending money. We actually spend more money traveling to see family and friends (i.e. getting quality time) than we do on gifts. It’s more about utility. I’ve brainstormed some “gifts” that you could give to people who speak each of the love languages. I wish I could implement this in my own life, but I don’t know the love languages of hardly any of the people I’m buying for! go ahead and buy presents! can you get away with a wrestling match?? Like I said above, I’m a quality time person. I’m overjoyed to simply have conversations with my family and friends or to play a game together. I don’t even mind spreading out the quality time among a small group. I would much rather have a 10-minute one-on-one conversation with someone than receive a present – and I wonder how many others feel the same way. Sometimes picking out a gift can be a cop-out because we can’t or won’t take the time and effort to get to know what the recipient really needs. I’ll take a baby step: This holiday season, I’ll find out/confirm the love languages of our parents, for future reference. What do you think of my proposal to give love language-specific gifts instead of presents? What is your love language and how would you like your loved ones to speak it this holiday season? Have you moved away from giving presents to expressing love through another language? 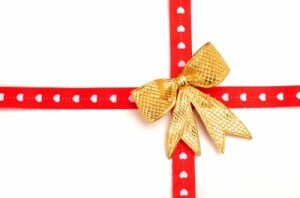 15 Responses to "All I Want for Christmas Is a Giving Revolution"
I think it’s a good idea! Mine is the same as well, quality time spent. It means so much more to me to be able to spend time with friends/family as opposed to another gift. 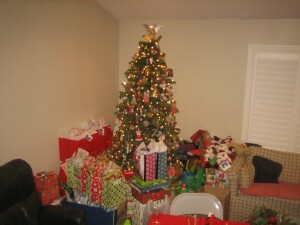 John S @ Frugal Rules recently posted..Frugal Friday: Posts That Ruled This Week, Christmas is in Two Weeks Edition! Glad to know I’m not crazy! At least the holidays (usually) involve quality time. As I’ve gotten older, I’ve come to appreciate my grandmother’s position as a Jehovah’s Witness. Holidays don’t really do much for me anymore. Get together and eat a big meal? We could do that any day. Edward Antrobus recently posted..Cheap vs Frugal: How Far is Too Far? I don’t know anything about the Jehovah’s Witness view of holidays, but I can’t get together any day to eat a big meal with friends and family so I do like the holidays for that purpose! It took me a really long time to understand this basic point — and now my relationship with my mom is amazing! Kathleen, Frugal Portland recently posted..Frugal Portland’s net worth is up over 250% in one year! Fantastic post concept! I love it. I haven’t finished reading that book and I really need to. The book was very helpful for understanding my parents and myself better – we all have different love languages so their behavior has seemed bizarre to me at times but now I get it!